The side story: I took this photo in Chicago over 15 years ago so it's a scan of an old print of mine. I like it but the daughter didn't. Her response when I emailed the photo was "I don't love this picture... It was hard to think of one. I guess the first one that came to mind was the quote below, but like I said, I'm not sure I'm on board for this photo... " I love that. I love that we can be this honest with each other. I love this photo - but then - I thrive on order. It also has a strength to it. But the quote - it speaks to the side of me that recognizes my own weaknesses and frailties. That He is the Potter and I am the clay - I am only molded into something useful by His hands and where I lack - my open spaces - that is where His strength is truly allowed to be seen. Quite a lovely pairing I think ladies. And that kind of honesty - well, that tells you volumes about your relationship, doesn't it. Its so nice that you have a great relationship with your daughter. Its so important! Btw: I love the photo and I think it fits the quote:) Enjoy your weekend. It seems that spring is here...Yay!!! Oh Jeanette this is one of my favorites! i think it's beautiful:) it reminds me of a similar picture i took while also in chicago, at the bears stadium. those big pillars are amazing! what a great way of sharing and practicing how to see something through someone else's eyes. xo. The honesty is great!! LOVE the photo and this is the first time I haven't loved the quote for it as much - but then we know why - she just wasn't feeling the photo - and it happens!! You clearly have an amazing relationship! Hmmm...yes, it does show that M isn't in love with the photo but I love the photo and the quote! It's a great part of our relationship that we are so honest with each other. Happy weekend to everyone who isn't heading into finals week! ...which makes your Friday "she read, she saw..." post even better!! Oh honesty! And I think it's great that you used the photo anyway. It just shows the variety of opinions that are out there and how we all view the world a little differently. I quite like the photo...and I'm always impressed with the quotes your daughter comes up with! Oh, and Jeanette - watch out for squirrels! Yes, that app places the furry guy into your photo. I definitely love the photo! Have a great weekend! You have to give her credit for being honest... LOL. Have a fabulous weekend! 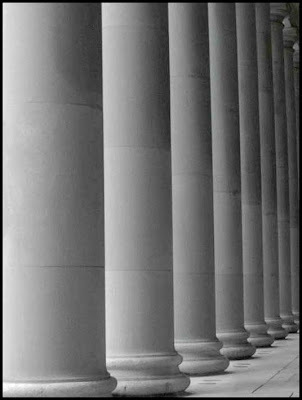 I love columns and I love this pic, though I have no quote to go with it. 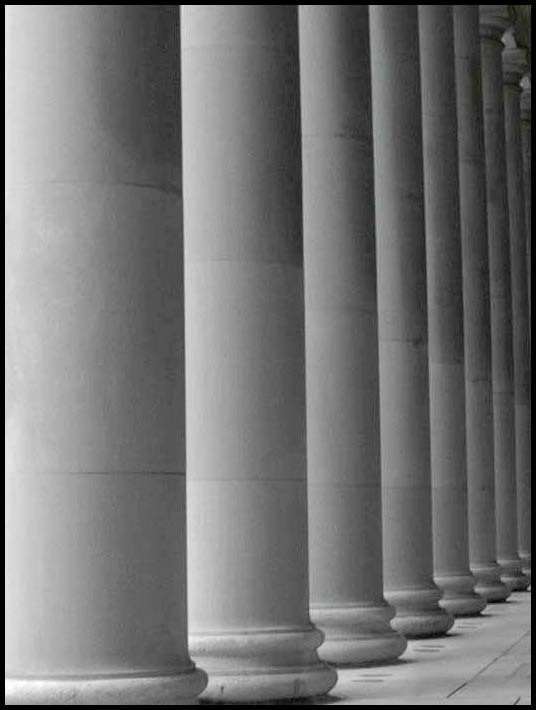 Columns create order out of chaos, they hold up big ole roofs. They make me feel calm. I needed this today. Thanks. I love the relationship that you guys have and I love this tradition. I also love the quote! i took a picture almost identical to this in haifa, israel. so lovely. what a great dynamic between the two of you! have a lovely weekend! I love this picture and your daughters quote!! It is the best that you are both honest...But I like the photo! i had to read that quote a few times as it was thought provoking. i DO like the photo!